Tile specialists Topps Tiles Plc, announced its annual financial results for the 52 weeks ended 30 September 2017 today, reporting a loss of 1.5% in group revenue since the 52 weeks ended 1 October 2016, from £215.0 million to this year's £211.8 million. Like-for-like revenue declined by 2.9% compared to a 4.2% growth last year. Profit before tax was reported as £17.0 million, showcasing a loss of £3 million since 2016 and a drop of 15% profit year on year. The group has increased its trading by a further 20 stores, as the first eight weeks of the new financial period saw group revenues on a like-for-like basis grow by 3.2%, commenting on the results, Chief Executive Matthew Williams said: "The business responded well to the more challenging trading conditions we experienced in 2017, maintaining tight control of costs to help offset the reduction in gross margin and continuing to make good progress with its strategic initiatives. "While we are retaining our prudent view of market conditions for the year ahead, we are encouraged by this return to like-for-like sales growth. We are confident that the combination of the significant further potential in our strategy of "Out-specialising the Specialists" with our accelerated plan to grow in the commercial tile market will underpin our future success." Senior market analyst at City Index, Fiona Cincotta comments: “The outlook statement is surprisingly encouraging, with a healthy rise in like-for-like sales in the first few months of the year marking an end to the deterioration that was evident throughout the entire year last year. "Investors will no doubt lap that up, though they shouldn't get too carried away. "Consumer confidence remains on shaky ground, so it's likely that many DIYers will hold back on big-ticket renovations until there is more clarity on Brexit negotiations. "That said, these pleasing early sales figures indicate efforts to expand the range and improve customer service are gaining some traction. 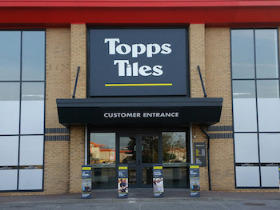 Established 1963, Topps Tiles is a supplier of tiles and associated tools and accessories with 372 stores nationwide, up from 352 in 2016.